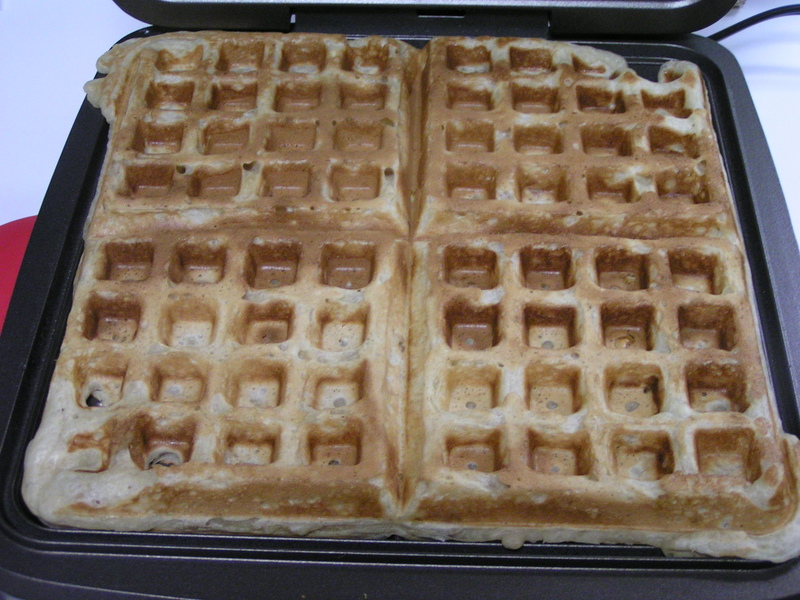 Sunday morning I decided to treat Hubby and Rat Boy nicely for a change to breakfast, so I pulled out the waffle iron and made waffles…not from mix! And while it wasn’t effortless, it was certainly worth the small amount of effort that it actually took! I need larger bowls, though. 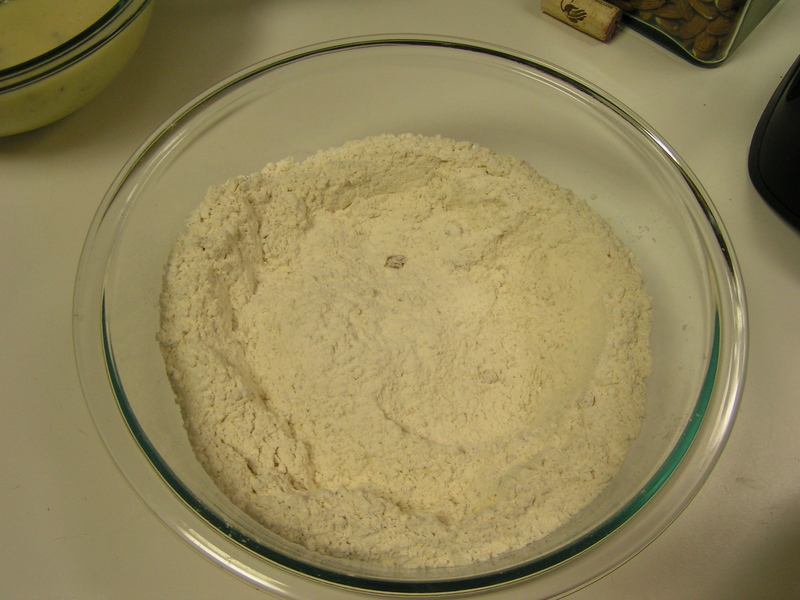 In a large bowl, combine 3 cups flour, 1 tbsp baking powder, 1 tsp baking soda, 1 tsp salt, and 1/4 cup packed brown sugar. Wisk to mix and break up the sugar. 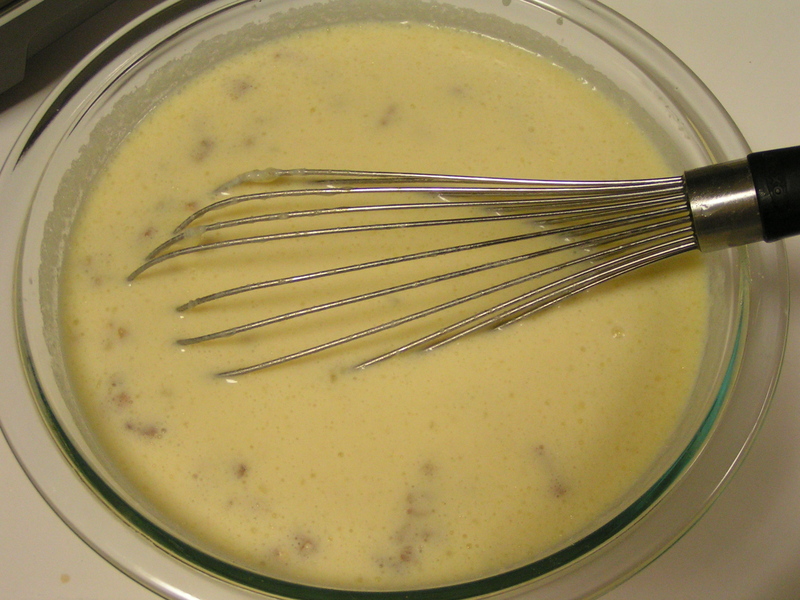 In another bowl…NOT SMALL…whisk together 4 eggs, 2 tsp vanilla extract, 1/2 cup melted butter, 2 1/2 cups buttermilk, 2 – 3 bananas, and 1/2 cup chopped walnuts. I started to get a little nervous that all of this was not going to fit into the large bowl I was using. I also ran out of buttermilk, so actually used about 2 1/4 cup buttermilk, and another 1/2 cup skim milk (which was the only other milk I had). 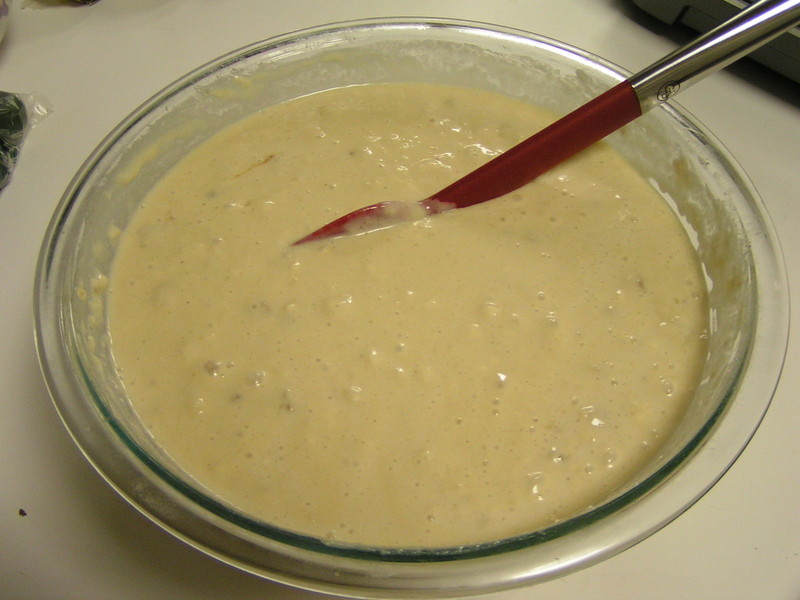 Combine wet and dry ingredients all at once, and stir until just mixed…a few small lumps are okay. I cooked these on medium. 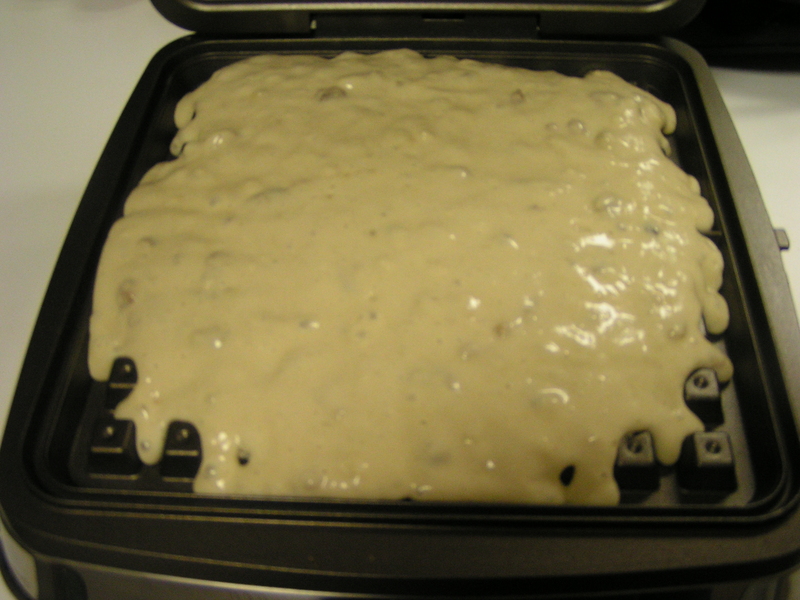 I love my waffle iron. Technically, it’s Hubby’s, as I gave it to him for his birthday 2 years ago. 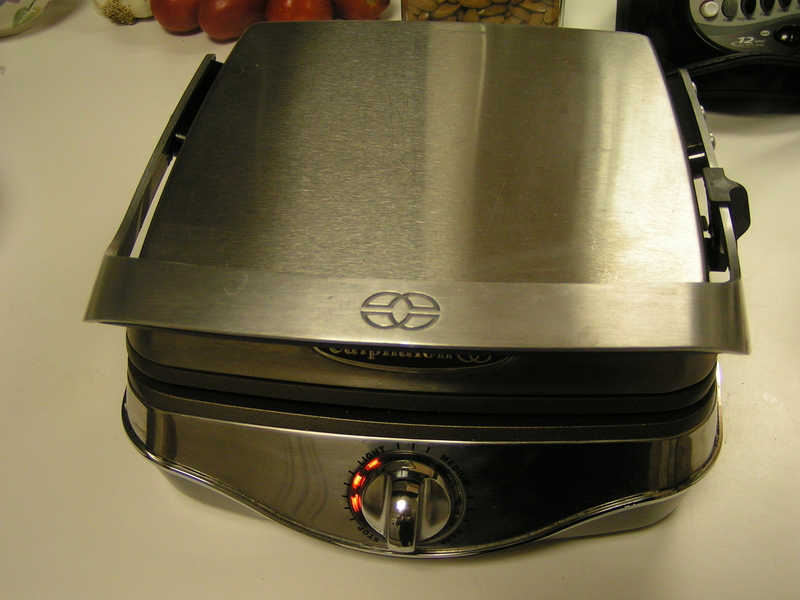 It is a very smart waffle iron. It dings when the waffle is done, so I don’t have to time it! They really smell wonderful while they are cooking. I ate one as soon as they were done. (Had to check and make sure they were all right! :-P) The recipe made about 5 large waffles. We ate 4 of them. They were scrumptious! 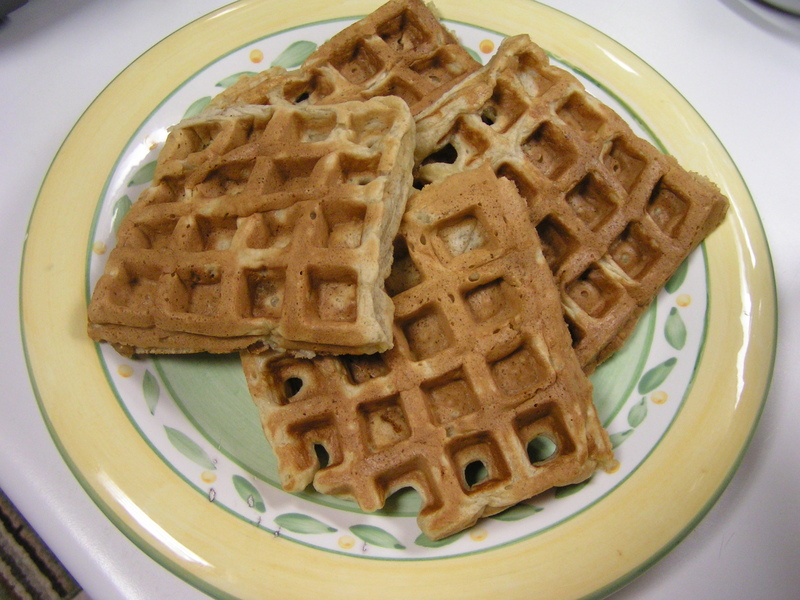 I don’t usually like maple syrup on waffles, but the banana walnut flavor really complemented the maple flavor. I put all my bananas into the batter, but some on the top would have been nice, too. Strawberries would be good as well. 😀 Needless to say, I’ll be making them again…in a larger bowl! You can come up this weekend for my Pampered Chef party and get some bowls!